In particular, in growing cities sustainability is a huge challenge for urban development and housing politics. 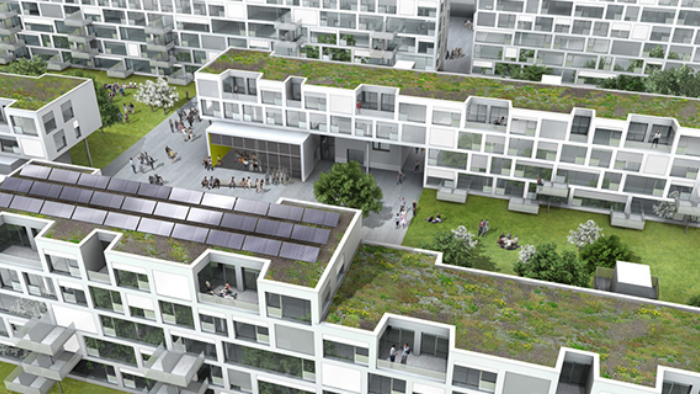 Therefore, the Swiss City of Zürich has set the ambitious goal of becoming a 2000-Watt-Society by 2050. In 2008, the City of Zurich took a groundbreaking decision. Over three quarters of the electorate voted for committing to sustainable development, reducing the energy consumption to 2000 watt per person, reducing the annual CO2 emissions to one tonne per person by 2050, promoting renewable energies and energy efficiency, and not renewing investments in nuclear power plants. With this strategy, Zurich intends to combat human-induced climate change, and in addition, there are social, economic and ethical arguments for lower energy consumption. One strategically important opportunity to reach these aims is the renewal of the housing stock and the construction of new settlements. For that, housing associations play a very important role in Zurich, also with regard to the discussions about affordable housing, cooperative living and quality of life. The two case studies of Hunziker Area and Kalkbreite in the City of Zurich stand exemplary for a high demand of comprehensive sustainability planning and construction. High standards in planning and building as well as an ambitious combination of environmental, social and economic objectives and requirements have been realized by the housing cooperatives. Ecological and energy-efficient constructions, mixed, inclusive and affordable housing are not only guiding principles but were strictly pursued in the course of the implementation of the projects and later on. Sufficient living on a maximum of 35 square meters, in so called cluster-appartments, car-free, with a wide range of sharing-facilities etc. Against the background of the case studies success factors and restrictions for sustainability in cooperative housing are deduced and discussed. Furthermore, the question of transferring the Swiss experiences to other sites is treated. Heidi Sinning is Professor for City Planning and Communication at Erfurt University of Applied Sciences, Faculty of Architecture and Urban Planning since 2003, and Director of the Institute of Urban Research, Planning and Communication since 2008. Her focus of research is housing and urban development, sustainable development of settlements and open space, climate change, governance and participation. She got her doctorate from RWTH Aachen in 2002. Several visiting scholarships at University of Washington, Department of Urban Design and Planning, Seattle/ USA, Temple University, Department of Community and Regional Planning, Philadelphia/ USA, OTB - Research Institute for the Built Environment, TU Delft/ Netherlands, ETH Zurich, Centre for Research on Architecture, Society & the Built Environment, and Bartlett School of Planning, University College London (UCL). She was visiting Professor for Urban Management at Technical University of Cottbus, Faculty of Architecture and Urban Planning, is author of many publication and member of several boards.